Hugh Farmer: The HK Naturalist, Vol 2 No 3 Sep 1931, contains an article Our Local Oyster by Soame Jenyns. The article mentions two places where “good oysters” are produced in Hong Kong. 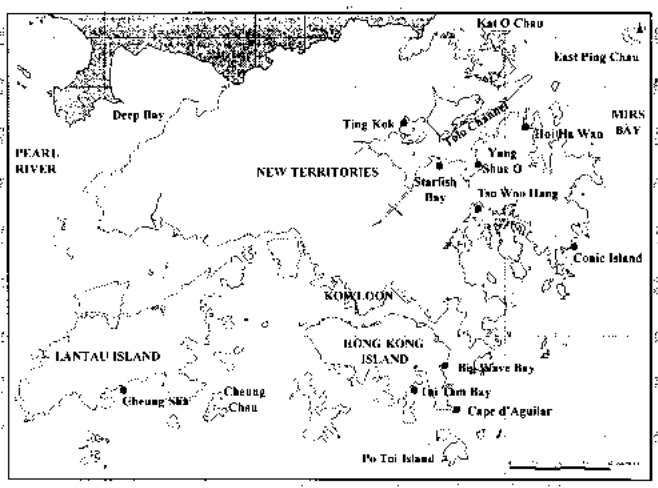 The map below shows they were also cultivated in other areas of Hong Kong. Peng Shan: I don’t know this location. I asked Thomas Ngan who says it “might be a variation of Ping Shan in the Yuen Long area. Most of the villages are of the Tang Clan. Hau Hoi Wan (Deep Bay) is quite close, just beyond Tin Shui Wai. 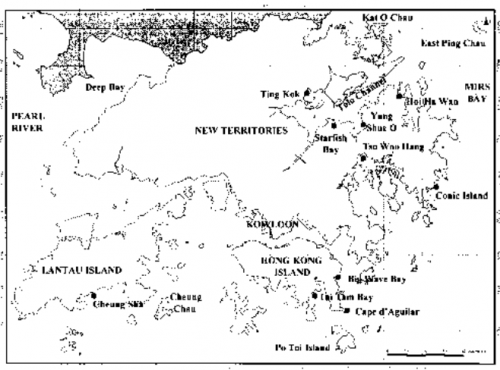 I wonder if Ping Shan was meant for the general area of Ping Shan, Tin Shui Wai, Ha Tsuen & Lau Fau Shan if oysters are concerned.” He has further added “The article quoted Peng Shan as (屏山). The Chinese characters are the same as present day Ping Shan. If you know more about the location of Peng Shan, as Soame Jenyns records it, do let me know. Hau Hoi also known as Hau Hoi Wan (后海灣) or Deep Bay lies off Lau Fau Shan on the north west coast of the New Territories. A bi-product of the oyster industry, namely the shells, were used in lime kilns. For example the island of Peng Chau’s first industry was lime kilns in the 19th century which saw some 11 factories burning the island’s supply of oyster shells, clam shells and coral to produce lime for use in paper and dye production, construction and ship maintenance before the industry went into decline in the 1950’s. The Shing Lee (Triumph) Limekiln factory at Nam Wan (South Bay) on Peng Chau is the only surviving site in Hong Kong to be listed as a protected heritage. This article was first posted on 14th April 2014. The article quoted Peng Shan as (屏山). The Chinese characters is the same as present day Ping Shan. Thanks for that. I have inserted your comment in the article. However, Ping Shan as shown on comtemporary maps is south of Tin Shui Wai and west of Yuen Long and several kms from the coast. I wonder if we can get confirmation of your suggestion in the early 1930s when the Jenyns report was published through a map of that time. I believe Ping Shan was mentioned owing to its status as a major village market place. The other major market place in the area was Kam Tin.